Over the years, I’ve shared many charts, graphs, and tables to help people understand that the welfare state is fundamentally unsustainable. And, assuming there’s not genuine entitlement reform, many of these fiscal estimates show that the United States has a very perilous future. According to the Bank for International Settlements, the United States is in worse shape than every nation other than Japan and the United Kingdom. According to the Organization for Economic Cooperation and Development, the United States has a bigger long-run fiscal problem than all countries other than New Zealand and Japan. And according to International Monetary Fund estimates of both future spending increases and the need for reform, no nation has a bigger problem than the United States. So do all these numbers mean the United States is really in worse shape than basket cases such as Italy, Spain, Japan, France, and Greece? Yes and no. I realize that answer makes me sound like a politician, but it is hard to answer that question because America’s grim long-run numbers are largely a function of rapidly rising health care spending. And if you assume that Medicare, Medicaid, and Obamacare are left unreformed, then the budgets for these programs will eat up an ever-larger share of our economy and we’ll eventually suffer a fiscal collapse. However, if you assume that these programs at some point get reformed (and it better be the right kind of reform), then the long-run outlook is considerably less severe. But notice that I wrote “less severe.” That’s because we still have a demographic issue. Any type of pay-as-you-go welfare state becomes increasingly expensive when there are more and more old people and fewer and fewer young workers. This is why new projections from the Pew Research Center are so sobering. They show the change in age dependency ratio between now and 2050. As you can see, we currently have about 50 young or old people for every 100 working-age people. 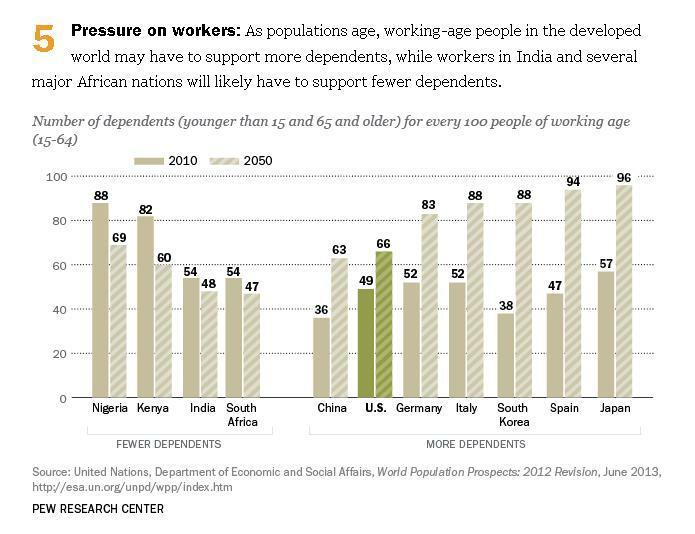 By 2050, however, there will be 66 dependents for every 100 working-age people. And most of that added dependency will be caused by an aging population, not more children. But here’s the good news. Compared to nations such as Spain and Japan, we’re in pretty good shape. Or, to be more accurate, we don’t face as deep of a problem. Indeed, it’s hard to see how those nations will survive. Same with South Korea and Italy. Even Germany has a very difficult future. Its welfare state may not be as bloated as some other nations in Europe, and the work ethic may be stronger than most other European countries, but as I already explained, any welfare state becomes unsustainable without new workers to pay taxes to support the dependent class. In other words, demographics can be destiny. 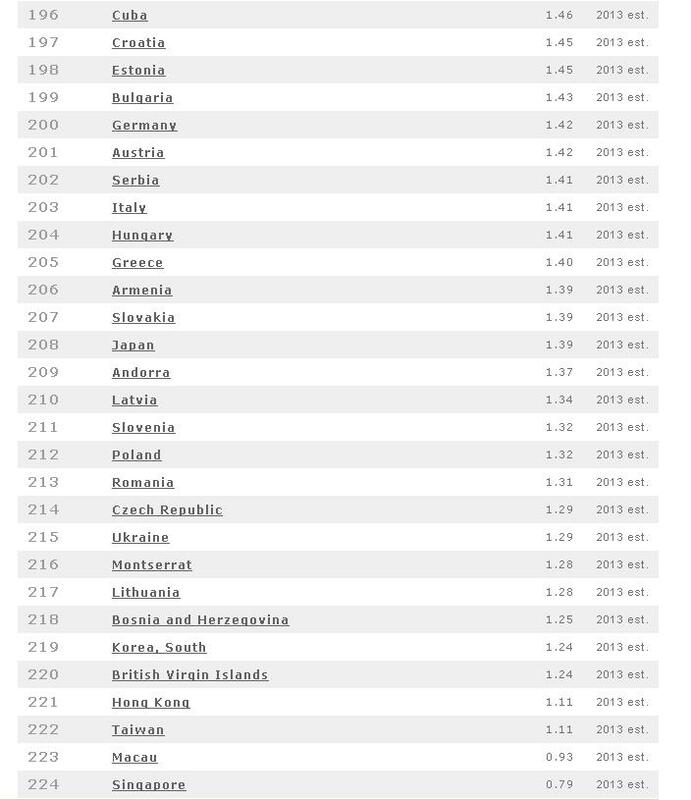 Look at this data on the nations with the lowest fertility rates. You’ll notice that Germans are not reproducing. And the same is true of the Japanese, Italians, and South Koreans (Spain is in 191st place, so they also aren’t having many kids). I don’t know where this will lead, but it won’t be pretty. Simply stated, the welfare states in these nations will have to be reformed. But how does that happen in countries where people have been told for decades that they have a “human right” to freebies from the government? I fear that European nations are going to suffer some major dislocations. And as this Michael Ramirez cartoon suggests, the same problem could happen in America. Let’s close with some optimism. You’ll notice that two of the four jurisdictions with the lowest fertility rates in the entire world are Hong Kong and Singapore. Yet there’s no major long-run fiscal crisis in those places. Why? Because they have “pre-funded” retirement systems. In other words, they have personal retirement accounts instead of tax-and-transfer entitlement systems. The moral of the story is that demographics can be destiny, but it doesn’t have to be. 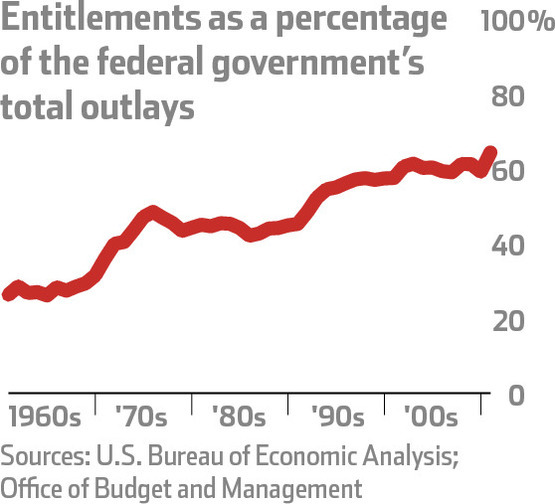 Something to keep in mind next time there’s a discussion of Social Security reform. P.S. Considering the high levels of pulchritude in Estonia, Latvia, and Lithuania, I’m mystified that there’s so little reproduction in those nations. Maybe I should volunteer to help out? Sometime while we were sleeping under a very comfortable sun called prosperity, the public sector masses were piling up a great amount of personal income, and future benefits. As long as we were prosperous, we did not care. Now that the worm has turned- partially due to their robbing of the coffers- we sit in a sad state. Meanwhile, the public sector “servants” are hoping this will all go away and we will ignore what they have done so that they can get back to their intended path. And they’re hoping that we will shave off just enough in other areas that their nest eggs will survive the public’s distemper. This is a WOW chart.